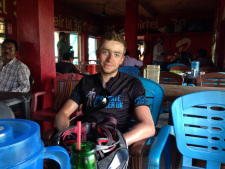 At 19, Tom Davies may be the youngest person to ever cycle around the world. Starting in London in January 2015, he cycled 18,000 miles in 174 days, most days going over 100 miles. He rode to challenge himself and to raise money for three charities; Prostate Cancer UK, The Sohana Research Fund and Carney’s Community. You can learn more about his adventure and the charities he is supporting at tomdaviesrtw.com. Tom Davies, welcome to The Pursuit Zone.